After a two-week long hiatus, The Flash finally returned this week to kick off its remaining episodes for the second season as “Versus Zoom” explored Hunter Zolomon’s origin story and how he became the monster that he is today: Zoom. As someone who has dived into the Flash mythology since the show started, I wasn’t sure what we were getting in terms of Hunter’s origin story as it was very clear that this would be a new take on that particular character. The idea we get is that, essentially, he had a dark version of Barry’s childhood where the father actually did kill the mother which got Hunter put at an orphanage as he didn’t have a Joe West that could take him in. While it is still so weird to see Teddy Sears having gone from good to bad, he is deliciously evil to watch as he is also breaking hearts everywhere. I’m still having problems understanding completely how this whole time remnant concept works and how Hunter was able to do what he did, but I’m sure by the end of the season, all will be clear. While this episode was heavy on Hunter/Zoom, we saw the progression of a lot of other storylines for almost all the characters, which doesn’t always happen in the same episode. We finally get that tie-in explanation to when Barry went to Supergirl’s Earth in the crossover a few weeks ago, even though it was strange that he didn’t even tell the team where he had gone. However, we do get to see the continuation of Barry’s training from that trip as he gets back to our Earth. Speaking of people with powers; Cisco took a huge step in his arc this episode as he began to learn how to create breaches and travel between dimensions. I really dig how they have handled the Vibe aspect of Cisco’s character this whole season and what makes it even more special is how he has Barry to guide him through this phase. It’s like how Cisco served that role for Barry when he was just starting out. That was just one of many great dynamics and interactions that we got to see in this episode because even though it is called “Versus Zoom”, this episode was also a really good one for the many relationships that this show has. One that I really enjoyed seeing were Iris and Caitlin getting to have a scene together where Iris starts to explore what she is feeling for Barry. It also made me sad to be reminded the tragedies that both of these women have gone through. We also see how Joe and Wally come closer to each other as father and son, who got me teary eyed many times. Again, despite that this was heavy on Zoom; I appreciate getting to spend some emotional time with these relationships. The race between Zoom and Flash was just a blast to watch, especially Barry’s determination, even though he does the slip-up of conversing with the villain for too long. I wish that the photos with Zoom taking Wally hadn’t been released in advanced because it did ruin that shocking moment. The only thing that I’m scratching my head for is that Barry just gave up his speed to Hunter once Wally was released. I get that he was scared of perhaps risking everyone’s lives by trying to trick Zoom, but at the same time, we had seen in this episode that he could outrun him and therefore maybe stand a chance. 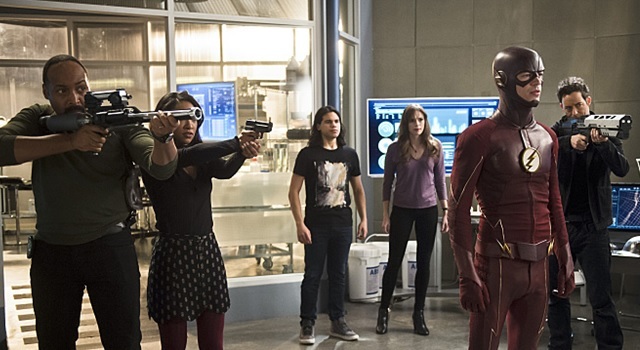 Those final moments when we see our hero fall again and Hunter committing one more evil act, which was kidnapping Caitlin, you could really feel that we are in that period of the season where things are coming to a close and that the war is going to the next level, episode by episode. I was just left speechless because I didn’t any of this that happened in those five last minutes coming. I was almost sure that this episode would have concluded with Barry finding out about the fall hero on Arrow and hence why he would be late to the funeral because of Zoom, which the Arrow Season 4 premiere established. Overall, “Versus Zoom” packed in a lot of things for the audience to chew on and while I still have questions about Hunter’s history, this was a strong return as we now head into the last few episodes of the season. The Flash airs on Tuesday nights at 8/7c on The CW.